Teaching children to be responsible for their belongings and helping them to maintain simple organisational systems from an early age, helps them to develop important lifelong skills – they learn to value their belongings and how to be part of a family with shared responsibility to make life living together enjoyable, they learn how to sort and categorise, plus the ways in which toys are organised clearly influences the ways in which children play with them. Neat, ordered, uncluttered systems provide children with space to plan and imagine and interact more fully with a chosen toy and with each other. Having worked with many children in many classroom settings, as well as having lived in a one bedroom apartment for the first year of Immy’s life, a small house with one living area which we all needed to share for her second year, and now a larger home where she has a dedicated playroom, I have found that the number of bodies, number of objects and amount of space available all impacts upon how easy (or more likely, how difficult) it is to have children help with maintaining their belongings. 1. Start young but have flexible expectations. I think it is good that children get into the habit of helping to pack away and clean up but we also need to consider variables like their age, the time of day (ie. are they overtired or hungry), what else is going on at the time. Be consistent but realistic. 4. Make pack away time fun by singing a song or playing music as you tidy up. 5. Build routine tidy up times into your day. For example, before lunch and dinner have a five minute tidy up together. 6. Use a timer. Setting the timer for 3 minutes and seeing how much get’s packed away makes it into a game for preschoolers. 7. Have familiar, clearly identifiable places for belongings to go – books, toys, dress ups, art materials. 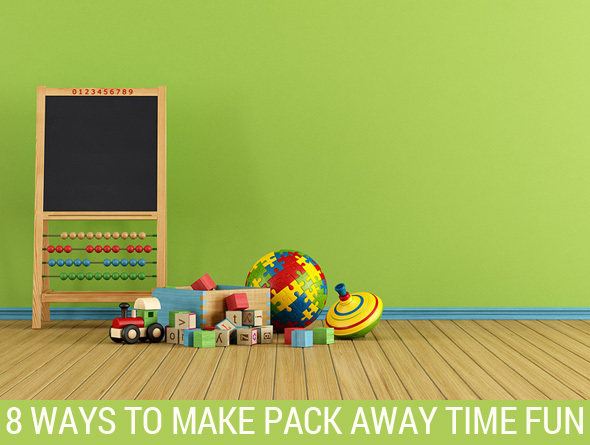 How do you make pack away time work for your family? I have self confessed issues with packing up... they are my issues not my kids but they impact on my kids and my ability to deal with the whole packing up trauma! And yay for being an organisation guru and in a published on at that!!! I always tell families who enroll in my school that clean-up time is the single most important part of our curriculum. Even kids who fight it at first wind up being swept up in the singing, silliness and cooperation of putting the classroom back in order. I think I'll steal some of your language for my next parent meeting! Hmmm... I think what works so far for me would be some of the stuff you shared: Packing away toys with the boy, having a routine of packing after playtime and having set areas for toys to go. I try hard with packing away myself, and helping the kids to pack away too (usually a song is involved). Mostly though - I'm lousy at it. We're a work in progress...! I have some trouble with the exact expectations; for example, I went through all our "little toys" and made these delightful little labels to show which bin was for Mr Potato Head, which was for dinosaurs, which was for balls, etc. Only to realize that small children are unable to sort very well, and older ones often need a lot of help! So I sometimes have trouble with figuring out exactly how much to expect. But I love the timer, for sure. I set it for 3-5 minutes, depending on everyone's mood and how messy things are, and we see how much we can get done. When the timer beeps, we get to see how well we did, and it's a chance to be proud of what a good job we did, instead of nagging that there's more to be done. And speaking of nagging, I learned that when the littler ones inform me that that the toys are picked up (and they clearly aren't), they respond very well if I suggest that they go "see if you can find anything else you can put away." It's tempting, especially in the middle of preparing meals, to nag and tell them they're not done, because I can see puzzles all over the floor! But that doesn't make anyone feel good and doesn't get toys picked up. Offering them a chance to try to do even more is much more effective and makes everyone feel better. Glad to hear others are a work in progress : ) We are too! I totally stole an idea from www.aspiremum.blogspot.com She uses music as a motivator and puts it on about half an hour before lunch and then again at dinner. It's a great idea I think and we've enjoyed using it more recently. It has worked since Miss M was little but I think I needed a new idea. Jack Johnston's 'Sharing Song' helps us tidy up. Everything in our playroom has a special box/container to go in which then goes into a lovely Ikea cube storage unit. It's new to our house and I am LOVING it! Before we had four separate boxes with picture labels on them for Miss M to sort her toys into. We outgrew these boxes with the Op Shop hunts I do. Ooops! Clothes + shoes on the floor are our big messy thing to work on in our house. Congratulations on getting a mention in Bambino Magazine Christie. It's a great read. I have taught my 2 year old son to always give his toys and books a kiss and cuddle and say "I love you" after he has finished playing with them then putting them away. This hopefully will help him to appreciate his possessions. He is pretty good doing this on his own now and I often catch him doing it without promting from me. Its very hard for kids to pack their things up...especially if they used to put and scattered their toys everywhere....they just need time and encouragement from their parents to this...Help them pack away and make packing away fun for them.